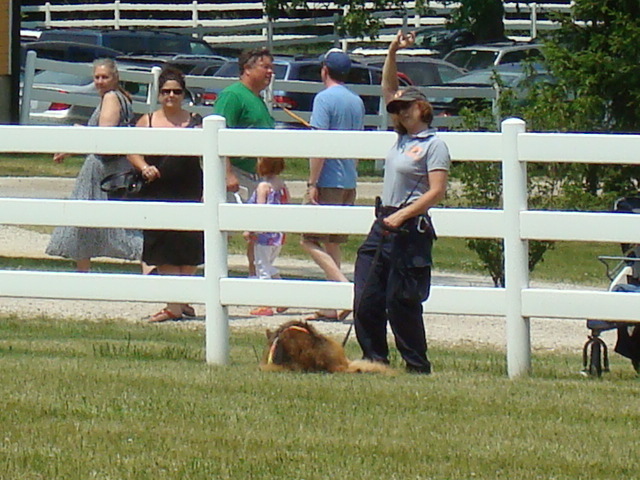 German Shepherd Search and Rescue Dog Association (GSSARDA) was honored to be invited to demonstrate at the St. James Farm Family Field Days in Warrenville Illinois on May 26, 2012. The weather was great and over 4,000 people attended to see demonstrations by falcons, horses, and dogs. The entire team was in attendance along with a volunteer, Samantha. 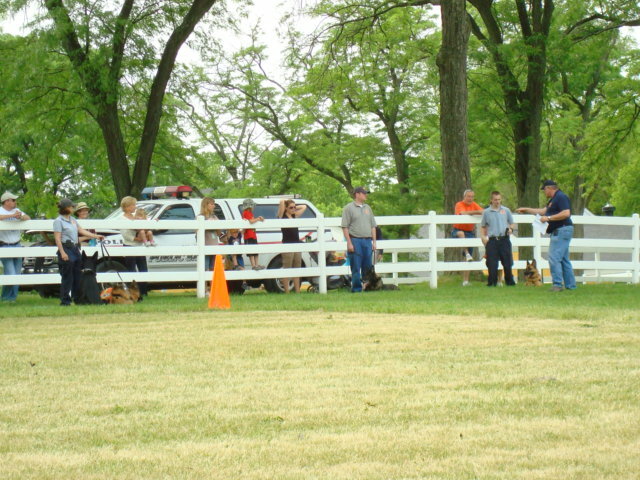 The team put on two demonstrations, one in the morning and a second in the afternoon. Belle downed to indicate the credit card she found. Sherri holds it for the crowd to see. At the first demonstration, Jim was the MC and explained each demonstration as it was performed. Orex demonstrated play drive. The crowd roared and applauded when he ripped the cloth from the whip. Belle demonstrated Bark alert, obedience and tracking. She did a nice job, scenting from a glasses case and finding a credit card and a used shotgun shell. Rosie did an excellent recall/re-find and even demonstrated alerting to HRD. This is especially impressive since she only started on the scent a couple of weeks before the demonstration. Retired Lektor had a blast showing the youngsters how doggy baseball is played. The group returned to the booth where a raffle was held and people were having their pictures taken wearing SAR helmets and packs with the dog of their choice. A diesel vehicle was pressed into service to cool the dogs as the temperature continued to rise. 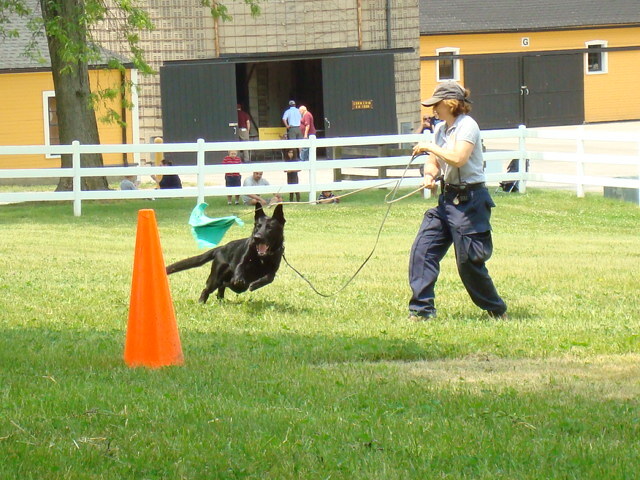 Bill MC’d at the second demonstration and Amanda handled Koda. Koda demonstrated play drive and bark alert. Rosie once again turned in a stellar performance as did Belle and Lektor. 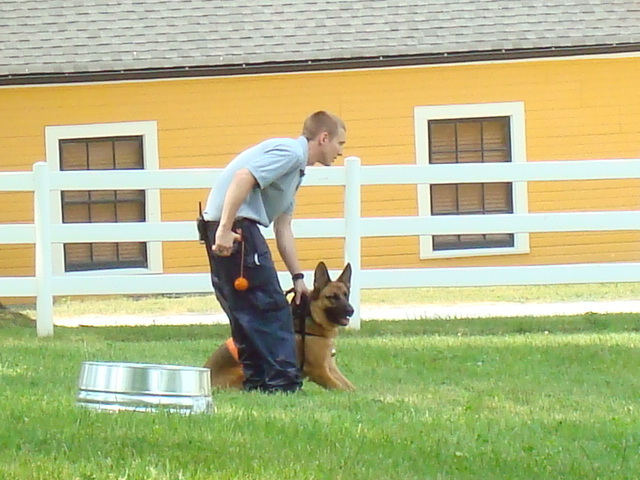 Sam handled Orex while the other dogs worked. Jim stayed back at the booth to watch over the activities there. It was an fun and interesting day at a gorgeous facility. It is definitely a place to visit on a fine summer day. 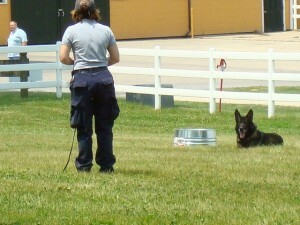 Lektor waits at a base for the next command as he demonstrates doggy baseball. I love your articles! What is doggy baseball? SAR dogs. I use wash tubs for bases but you can use any object as long as it is tall enough for the dog to see. Put one base on pitcher’s mound and one each on first base, second base, and third base all 25 yards from the pitchers mound. Start with your dog at home plate and direct him out to first, pitcher’s mound, or third base. He has to sit or down at each base you direct him to until you give the next command. You must remain at home plate and direct him to each of the bases with voice and hand signals, second base is the hardest to teach. Eventually you recall the dog and reward him at home plate. I’ll try and put up an article on how to teach it. Yes, that would make for a good article! Thank you!